Step 1: Start by going to the 'Create' tab, find the Quiz you'd like to change the settings for, and click 'Edit'. 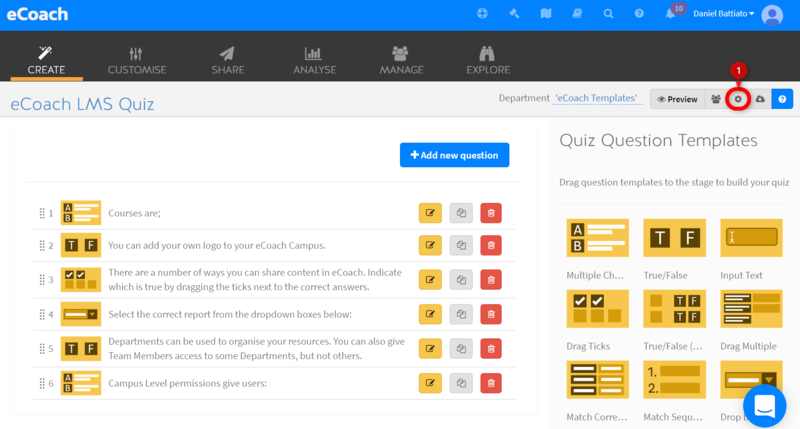 Step 2: Click the cog icon called 'Module Settings' located near the top right of the screen to enter the Quiz setting page. I've found the setting page for my Quiz, but what does each setting do? Number of attempts allowed: This allows you to grant unlimited attempts at the Quiz or limit the Participant to a specific number of attempts. Show correct responses from previous attempt: Selecting this option will display questions that were marked as correct on their re-attempt and also have the correct answer pre-selected. Attempt Scheme: Selecting 'Highest Grade' will require the Participant to answer questions based off of their current highest graded attempt from a previous attempt. Selecting 'Latest attempt' will require the Participant to answer questions based off of their most recent attempt. Grade to pass this Quiz: This setting allows you to determine the percentage of the Quiz the Participant will need to correctly answer before it can be graded as a pass. Any score that does not reach this threshold will be graded as a fail. Require participant to receive a passing grade: If you select this option, the participant will be required to reach the pass threshold before being able to move on to the next module. If the student fails their last attempt allow them to complete the quiz without passing: Selecting this option will allow the Participant to move to the next module in a course if they were unable to attain a passing grade. Whole Questions: The Participant will be graded on each question as a whole. Hide details of result: If this option is selected, the Participant will not be shown their results after completing the Quiz.